Matilde is amazingly creative and skilled in this clip. It takes quite a lot of talent to be able to pull off layering like she does here. Her beatboxing, harmonization, and advanced musicianship make this a mesmerizing performance. It is clear that Matilde is talented in many ways aside from just her great singing voice. Because of all that is going on in the layering and the electronic effects, it is sometimes difficult to hear and appreciate Matilde’s very nice vocal tone. When you can hear it on the solo lines though, it is evident that she has developed a lovely pop Mix tone quality. Pop singers often sing with a brighter sound that incorporates elements like Twang, Nasal Resonance, and Higher Larynx positions. I would encourage Matilde to add some slightly deeper and darker resonances to her voice via some slightly lower Larynx positions. Also, she will benefit from some decompressed or “breathy” qualities within her Mix as well. Not just for style, but also for her Technique. It will keep her sound more balanced. Overall, this is a very impressive and inventive performance! Although all four artists were very talented and gave great performances, my pick is Matilde Paul. I chose her because her performance was so inventive, creative, and diverse. She incorporated beatboxing, harmony, modern pop/dance layering technology, advanced musical skills, and her great pop Mix tone into a very difficult-to-achieve final product. Truly well done Matilde! Bravo! And, congrats to all on your excellent singing! Hi! 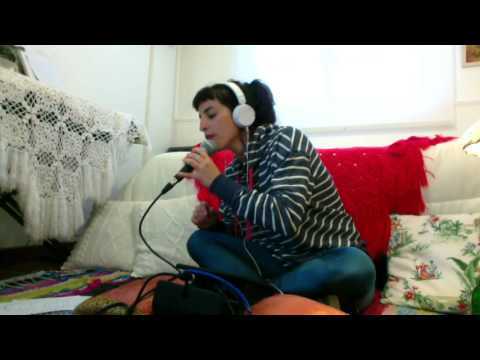 i´m Matilde from Argentina, i´am a singer and music composer. This year i´ve started using the Voicelive Touch 2 and i really think i have found my element.!!! Thank you guys for this opportunity, to let me show what i am doing! This singer was a finalist in our competition which ended on January 15th 2017. Submit your own video here!